A roundabout consideration of why humans turn to otherworldly thoughts. Boyer (Collective Memory and Individual Memory/Washington Univ.) is fluent in several disciplines that touch on the cognitive sciences, including physical anthropology and evolutionary psychology. All of these disciplines, along with classical philosophy, come to bear on his account of why humans in every place and at every time have found it necessary or desirable to think of gods, the afterlife, and other extraordinary matters, building “complex supernatural constructs out of very simple conceptual bricks” (such as the recognition that all mortal beings die). 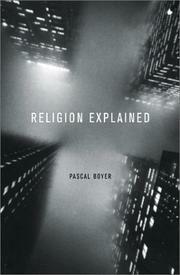 While recognizing that religious beliefs vary widely within and between cultures and individuals, the author suggests that we hold them largely because we can; that is, all humans possess “the mind it takes to have religion,” a mind that uses processes such as “decoupling” and “inference systems” to arrive at what Boyer considers to be eminently practical reasoning about the meaning of life (reasoning that can sometimes involve inventing cosmic explanations for the mysteries and problems the mind confronts). Regrettably, the author is rarely straightforward in making such arguments, preferring instead to linger over (and then demolish) straw-man arguments and to show the flaws in other influential theories of religion (such as those of William James). The noted biologist E.O. Wilson gives a more concise and better argued account of the evolutionary basis of religion—if one that seems calculated to offend believers, as Boyer’s is not—in Consilience (1998). For all that, Boyer’s account has many merits, showing how the mind works by means of analogy, trial and error, and sheer speculation (the more counterintuitive the better) in the service of helping us to become comfortable inside our own skins and sleep well at night. Students of psychology and philosophy will find much value in Boyer’s treatise, but it will probably strike most general readers as dry and daunting.